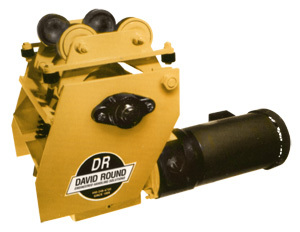 The David Round Company is a leading supplier of industrial use trolleys and tractor drives. Our trolleys and drives are available in both carbon steel and stainless steel models. David Round’s RailRunner™ tractor drives, also known as trolley drives, bridge drives, bridge crane drives, hoist tuggers, or even Lo-Hed® drives, provide the push and pull to position overhead loads on a monorail or enclosed track. David Round’s RailRunner™ products incorporate sleek design upgrades and beefy construction. David Round provides decades of leadership in the manufacture and supply of trolleys and carriers. Select from stainless steel trolley products, fixed wheel and articulating styles. David Round manufactures manual, hand-geared and motorized versions of stainless steel trolley products. These stainless hoist trolley products are ideal for pharmaceutical, food manufacturing, or other environments requiring wash down sanitary equipment or corrosion resistance.